Before we look at a couple of recent batter-runner interference plays, let’s review the provisions and “interpretations” that cover rule 5.09 (a) (11) and the 45-foot long, 3-foot wide runner’s box that has been around since 1881. Keep in mind that the rule is designed to protect the fielder “taking” the throw, not “making” the throw. (1) There must be a possible play at first base. (2) The rule does not require the batter-runner to run in the box but if he doesn’t, he runs the risk of being called out for interference. (3) If the defensive team completes the play for the putout, there is no violation regardless of the position of the batter-runner. But it’s precisely this aspect of the rule that has allowed the batter-runner to run liberally outside the box. It’s possible that the first baseman or second baseman can complete the play but suffer a serious injury in the process. (4) To be declared out, the BR must interfere with the fielder taking a quality throw which has a chance (umpire’s judgment) to retire the BR. In other words, the throw does not have to be a perfect throw but one that has a chance to retire the BR. Umpires take the runner out of the play when evaluating the throw. The umpires must determine if the fielder would have caught the ball had there been no runner coming down the line. (5) The first 45-feet to first base is open real estate for the batter-runner. He basically has no restrictions on thrown balls unless he intentionally interferes with the play. (6) If the batter-runner remains in the box the last 45-feet to the base and for some reason his position interferes with the throw to first base, or he collides with the fielder, he should not be called out unless the interference is intentional. (7) The batter-runner is not to be charged with interference if he is running out of the box if the defensive team has had ample room or a good throwing lane to make the play even if he is struck by the ball. This is not part of the rule but in my opinion how the rule has been umpired. Seldom do you see the rule invoked when a throw is coming from the left side of the infield or the second baseman. (8) Interference should not be called if the defensive team does not throw to first base regardless of the position of the batter-runner. Often times the pitcher or catcher will hesitate and not throw because the batter-runner has taken away the throwing lane by running outside (to either side) of the box. (9) The batter-runner does not have to be struck by the throw for interference to be called. But over the years pitchers and catchers have thrown at the batter-runner to influence the call. If the batter-runner is hit by the throw, however, there is no guarantee that interference will be called. (10) The lines are part of the box. If the batter-runner has any part of his foot on a line that forms the box, he is considered to be legally in the box as long as his other foot is entirely in the box. (11) Normally the plate umpire makes the call but it can be made by the first base ump. The Cubs hosted the Giants on May 24, 2017. With runners on first and second and one out in the bottom of the sixth, Jason Heyward hit a comebacker to pitcher Matt Moore, who threw to first. 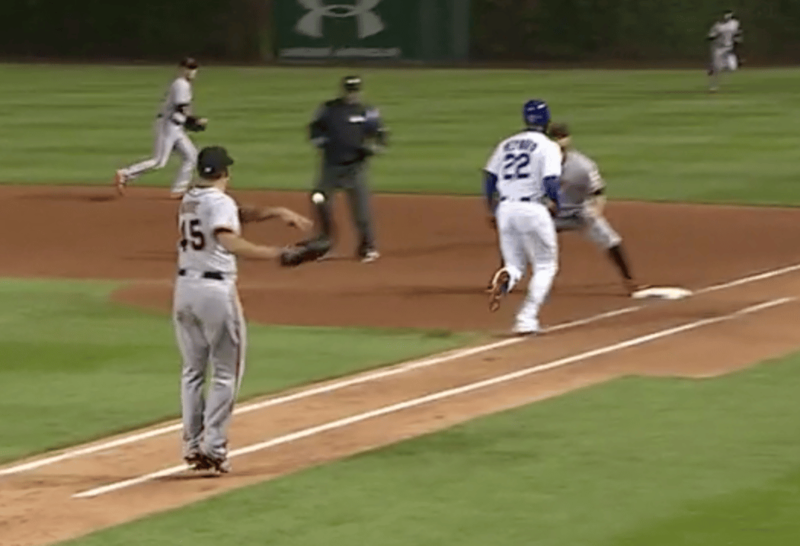 First baseman Brandon Belt couldn’t handle the throw. However, Heyward was called out by plate umpire Jeff Nelson because he ran on the fair side of the runner’s box, and in his judgment interfered with Belt’s ability to catch the throw. The runners had to return to the base they occupied before the pitch. Moore then struck out Addison Russell to end the inning. You can view this play going to the following link. In my opinion there are times in the game of baseball when common sense should trump the book rule. The above play I think is a good example. The batter-runner is permitted to exit the 3-foot lane by means of a “step,” “stride,” “reach” or “slide” in the immediate vicinity of first base for the sole purpose of touching the base. Heyward took two steps out of the box to reach the base. This is the reason that you can defend the call. And if there was no runner (Heyward) involved in this play, the throw would most likely have been a quality throw that was catchable. The common sense ruling, however, was probably a no call. Hayward ran almost the entire distance in the box. He had to exit the box to touch the base. Perhaps he exited a bit (one step) early but he was in the vicinity of the base. The “step,” “slide,” “reach” or “slide” language was put into the rule book about 10 years ago. One former umpire said, “They should have used the words “immediate vicinity” as a yardstick in the rule book and omitted the “step,” “slide,” “reach,” or “slide,” language as to when the batter-runner can leave the lane. This would give the umpires and players more flexibility when making the controversial batter-runner interference call. If Heyward made a slide to the base, it probably would have been in the same area that he took his first step out of the box. Yankees Pitcher Charged for Type A Obstruction Did Pitcher Throw at Runner for Interference Call?